A sturdy low-set dog, rather long in proportion to height with strong Terrier character, alertness, activity and soundness. Its untrimmed, harsh coat with definite ruff around the neck extending to the breastbone and its long strong head assist in developing its hard bitten, rugged appearance. 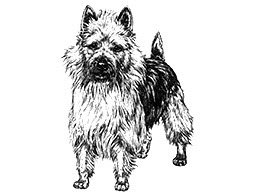 Essentially a working terrier, but its loyalty and even disposition make it equally suitable as a companion dog. Long with flat skull of moderate width, full between the eyes, and slight but definite stop. The muzzle, strong and powerful, equal in length to that of the skull, which is covered with a soft topknot. The muzzle must be strong and not fall away under the eyes. Nose black, of moderate size, the leather extending to the bridge of muzzle. The eyes shall be small, oval, with keen expression, and of dark brown colour, set well apart and not prominent. The ears are small, erect, pointed, well carried, set on moderately wide, free from long hair and sensitive in their use (puppies under six months excepted). Jaw strong and punishing, teeth large and evenly spaced, the upper incisors fitting closely over the lower (scissor bite), lips black, tight and clean. The length and strength of muzzle are essential to give the strong, punishing jaw. The neck is of good length, slightly arched, strong and flowing into the well angulated shoulders. The forechest is well developed, brisket relatively deep with forelegs well boned, straight and parallel when viewed from the front. Pasterns are strong, without slope. The legs are slightly feathered to the knee. Long in proportion to height, strongly constructed, with well sprung ribs and chest of moderate depth and width. The topline is level with loins strong and deep flanks. In considering the body, attention must be paid to the opening description, "a sturdy low set dog, rather long in proportion to height". Moderate length of quarters, broad with strong muscular thighs. Stifles are well turned with hocks well bent and let down. Viewed from behind they should be parallel from hock to feet, neither too wide nor too close. Small, round, compact, well padded, toes closely knit and moderately arched. Turned neither in nor out, with strong black or dark toenails. Docked: Set on high and well carried, but not over back. Undocked: Set on high, well carried, as straight as possible, may curve over back, well covered with hair but free of fringing. Note: When judging all importance must be placed on the set on of tail. The action to be free, true, springy and forceful. When viewed from the front, the forelegs should move truly without looseness of shoulder, elbows or pasterns. The hindquarters to have drive and power, with free movement of stifles and hocks. Viewed from the rear the legs from the hocks to the ground to be parallel, neither too close nor too wide. The body coat consists of a harsh straight dense top coat approximately 6 cms (approximately 2.5 ins) long with short soft textured undercoat. The muzzle, lower legs and feet to be free from long hair. Blue, steel blue or dark grey blue, with rich tan (not sandy) on face, ears, under body, lower legs and feet and around the vent (puppies excepted). The richer the colour and more clearly defined the better. Smuttiness is objectionable. Topknot blue, silver or a lighter shade than head colour. Clear sandy or red. The topknot of a similar or lighter shade. Any dark shadings or smuttiness undesirable. In any colour, white markings on chest or feet must be penalised.